Whether you are need of Galvanized pipe replacements or you are seeking a Sunnyvale copper repiping professional, our team at Gladiator Repipe has the knowledge and skill to get the job done right. Locally owned and operated, Gladiator Repipe is the Bay Area’s #1 choice for everything repiping. If your home was built before the 1970’s it is possible the pipes in your home are made of Galvanized steel. These galvanized pipes, although common for the time, they are very dangerous for your home and health. As time goes on the galvanized pipes rust and breaks down creating awful smells, leaks, and harmful drinking water. Contact our team of repiping professionals at 408-649-7920 or you can stop into our storefront located at 190 North Montgomery Street San Jose, California 95110. If you have noticed low water pressure, discolored water, or a metallic taste in your water, then you may be in need of galvanized pipe replacement in Sunnyvale. These can all be signs of rust or leaky corroded pipes, and they will need to be replaced as soon as possible. If your water pressure is low, then your sink and tub may not produce enough water. Taking a shower and other tasks can be difficult if the water pressure is too low. Contact our Sunnyvale copper repipe plumbers as soon as possible. Our copper repipe specialists in Sunnyvale are always focused on making sure that each job is performed correctly, affordable and most importantly, our goal is always to leave our customer’s happy with the service they have received. 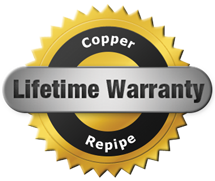 Whether we’re keeping our clients happy with affordable prices or great customer service, our copper repipe specialists in Sunnyvale have you covered. We that understand repiping jobs are very important to the community and to the homeowners having the services done. This is why we always go the extra mile for all our copper repipe services in Sunnyvale, we want to offer the best services to our community. We will take our time to make sure that copper repipe in Sunnyvale is done right, and we will answer any question you have along the way. You will benefit from the savings our team can offer you. Contact the Gladiator Repipe teams for all your Sunnyvale repipe needs.